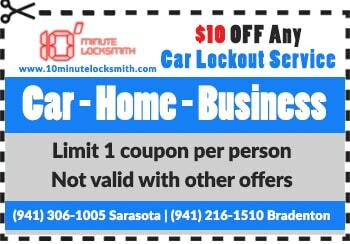 Getting locked out, a broken lock or key, an ignition that suddenly needs replaced, if you find yourself with a lock or key related issue or emergency and you're in the Sarasota, Florida area, there is no better or more reliable company to call for help than 10 Minute Locksmith. With hard-working and professional technicians available to you 24 hours a day, 7 days a week there isn’t a time, day or problem we can't fix or take care of for you as well and efficiently as possible. Your vehicle is your lifeline to the world around you; it helps you get to work, the store and home without a problem or a hitch. So, what happens when an unexpected issue comes up on the road and your locks or keys are involved? If you're in or near Sarasota FL simply call us up any time of day and we'll immediately be on the way to take care of it and get you back on your way. Well-trained and versed in potential automotive issues of this kind, our talented technicians can easily duplicate keys, re-key a lock, repair an ignition, or even unlock a door that got locked accidentally with ease. Wherever you are with your vehicle, just call us take care of your car and we'll be there fast and get you going again even faster. Keeping your home and family as safe as possible is the most important thing, which means the locks and keys you use to assure the space is secure is absolutely essential to your long-term peace of mind. 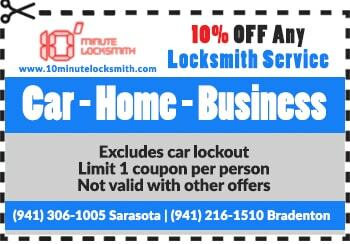 Providing Bradenton & Sarasota with a residential locksmiths you can really trust, let us install the locks at your home, replace old locks, re-key locks whose keys are now missing, Whatever you need the possibilities for security go on and on. Whether you need our technicians rushed out to your home in a hurry for emergency service or you need to set-up an appointment for routine work to be completed, the result of a visit with us will be your home feeling safer than it ever has before. Assuring the safety and security of your business is a must. Without your business up and running as it should be you can't make money and your livelihood could easily suffer. Don’t leave your future up to chance, cheap equipment or unreliable work, instead call us at 10 Minute from your local Sarasota location and one of our experience technicians will be on their way within minutes. 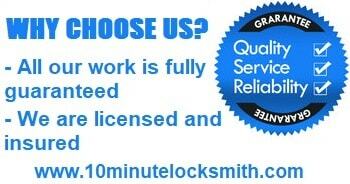 Fully trained and capable of taking care of any lock or key related issue you may have, let us let you back inside your locked office, re-key a lock to replace lost keys or simply install any lock you may need anywhere, The possibilities for services we provide in this area are nearly endless. Getting locked out, breaking a key or lock, as well as any emergency situation you can come up with, Whatever you need our talented technicians for we can take care of your problem quickly and easily. 24 hour a day, 7 days a week all year long there is someone who is qualified, ready, Waiting and available to fix the problem, whatever the issue may be. Final exams week is the most stressful week of the year for me, as someone who not only has to give exams as a teacher's assistant, I also have to take exams as a student, and I can get pretty forgetful about other parts of my life. This last finals week the thing I managed to forget what my apartment keys. The problem is that I managed to forget them on the bus, and now they're gone forever. It was the only key I had to my apartment so I had to call a locksmith to get back in that night when I realized they were gone. Honestly I was terrified I was going to have to sleep in the hallway until someone was open in the morning but 10 Minute was willing to send someone out right away. He did a great job getting me back in without damaging my lock at all and made me a new key. I somehow managed to get myself locked out of my own business safe… and figured out that I accidentally locked the only set of keys in the safe itself. So, I had to get the safe re-keyed so that I could get back into the thing without having to ruin my brand new safe. I had no idea who to call, so I went and asked the neighboring business, and they said that when they accidentally locked themselves out of the business door, they called 10 Minute and were really happy with their work. So, I called him, and now I know who my new regular locksmith will be. He was at the office right on time, and had my problem fixed in half the time I was expecting it to take. Now I am much more careful with the keys to my safe, but I always have their number close in case I need it.